The Fiber Event at Greencastle, Indiana. I'll be there with a booth full of gorgeousness. The booth is in the Community Building, next to the stage. Please stop in to say hi and show me what you've been working on this winter. 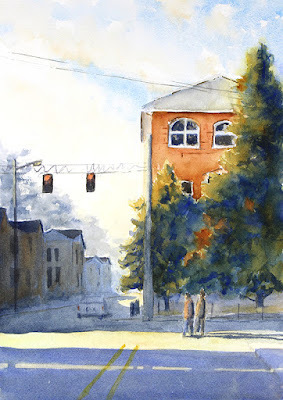 A couple of weeks ago, I took a workshop on cityscapes with Judy Mudd, who came up from Louisville for the day to teach us a bunch of tips and tricks. As always, she was friendly and engaging and full of knowledge and encouragement. This is what I painted that day. Cities are not my native habitat, so this was an exercise in architecture and in light & shadow. 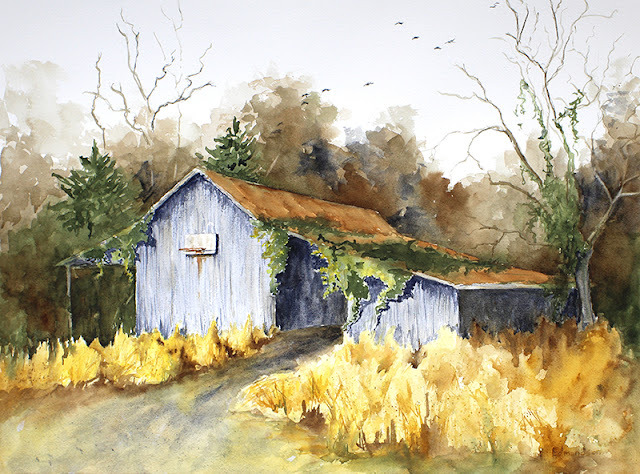 I'll take what I learned and use it to paint more of my favorite rural subjects. I had a lot of fun learning how Judy does people and cars and I was happy to be able to practice in this piece. I've taken workshops with Judy before and as always we had a great time. If you get a chance to take a class from her, do. Her 2 or 3 day classes taught in Berea, Kentucky are wonderful! 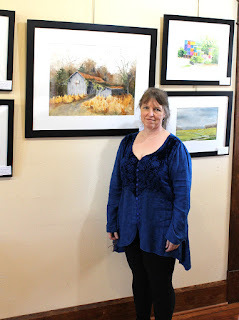 You can see Judy's award-winning work HERE. 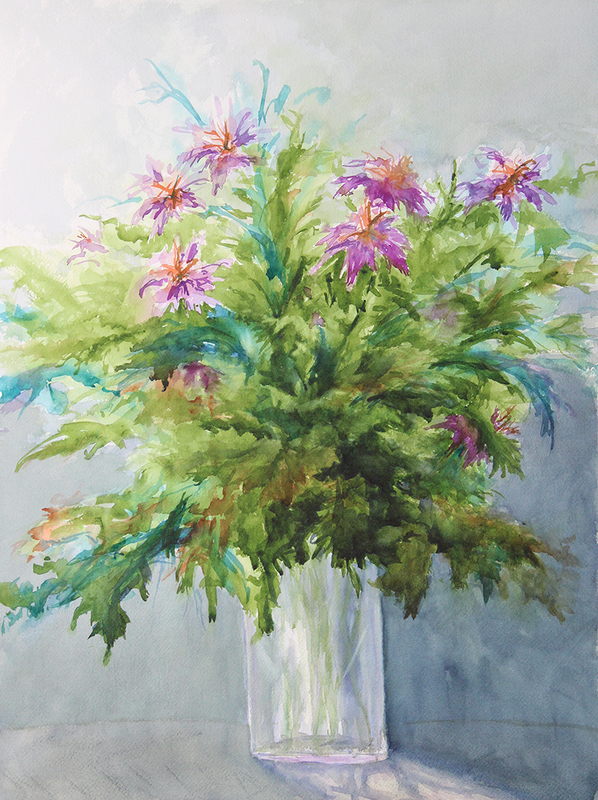 ©Robin Edmundson, 'Tetrad Floral', watercolor, 24 x 18 inches. For much of my life I have tried to live under the radar. It was safer that way. These rules are all shame-based and for 50 years, I was really, really good at shame. I'm breaking a lot of these rules lately. I don't want you to think that I just woke up one morning and said 'Screw the rules!' and made some changes. 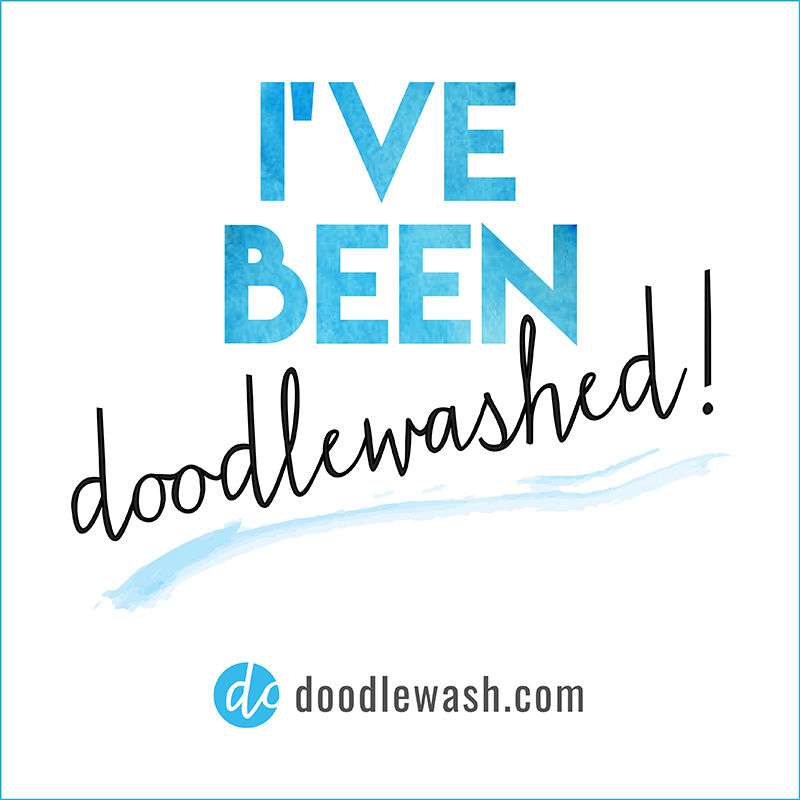 Confronting a lifetime of shame and changing how you think [about everything!] takes a lot of courage. A lot of time. A lot of patience. A lot of great teachers. And a lot of baby steps. One of these baby steps was to decide to paint bigger. Risk bigger, visible failures. So, I bought a few blocks of larger paper so I can work in an 18 x 24 inch format, which I have found that I love. I've been trying new subjects [more florals] and I've been playing big. And making big mistakes. And I don't care [as much as I used to. :)] The painting above is one of my new, larger pieces. 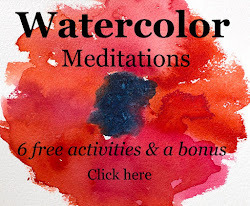 It started as a color experiment while I was teaching a Color Harmonies class here at my studio. At one point, I 'ruined' it but I kept working on it. It was so freeing to work on that lovely big paper! Bonus - I think I'm doing better work. Working bigger is helping me to take the next step in my healing process. Working bigger lets me see that I can, maybe someday, live bigger and heal bigger. 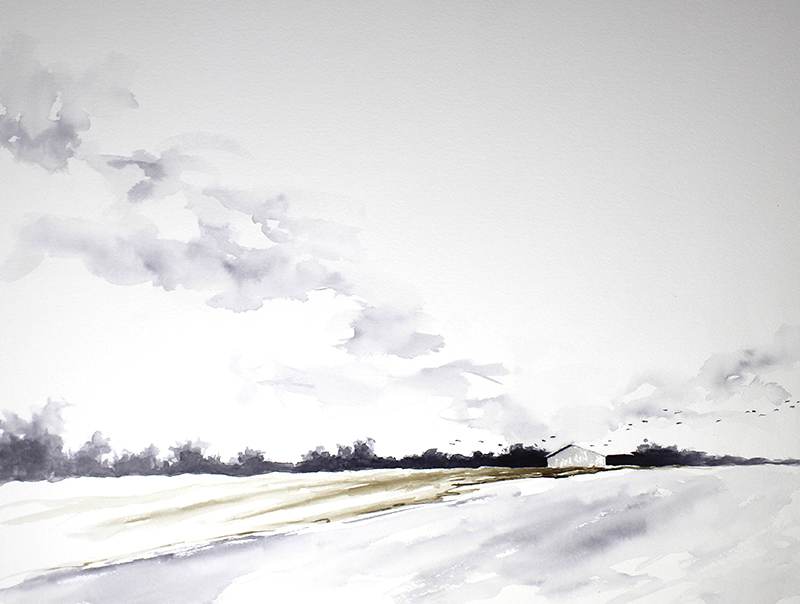 © Robin Edmundson, 'Midwinter Sky & Birds', watercolor, 18x24 inches. Framed to 26x32 inches. $750. I've been working with this scene for a while and I realized that what it really wanted was more space, so I worked it up in a larger format. I love it. Our winter palette is mostly umbers and ochres - until it snows, and for a few days it's hard to tell where the sky stops and the trees and fields begin. Then the trees shake off the snow and clouds and re-establish the boundaries. There is a stark beauty in a winter day like that, with scraps of earth showing through the snow. On a day like this, there is quiet in the clutter of our woods and farms, with nothing to distract from the ebb and flow of winter birds moving from one field to the next. I love this about Indiana. It is said that Indiana's state religion is basketball, so it's no surprise that so many of our old barns out here have a basketball hoop on them. Friends gathered before and after school to blow off steam. Fathers and children shot a few baskets on the way to feed the animals. I still remember the thump-thump of the ball hitting the wood and then hoop as friends practiced layups. These hoops are fixtures on our barns and in our hearts. My last quilt of the season is done. 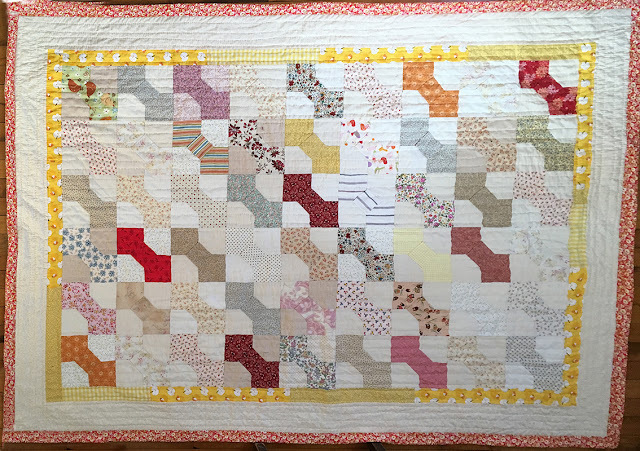 I've been wanting to do a bow-tie quilt for many years and decided to just jump right in. 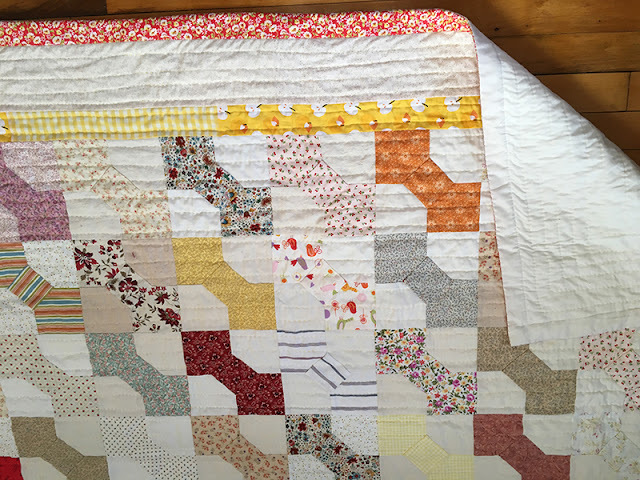 I pulled out my sunny, happy scraps in a large variety of patterns. 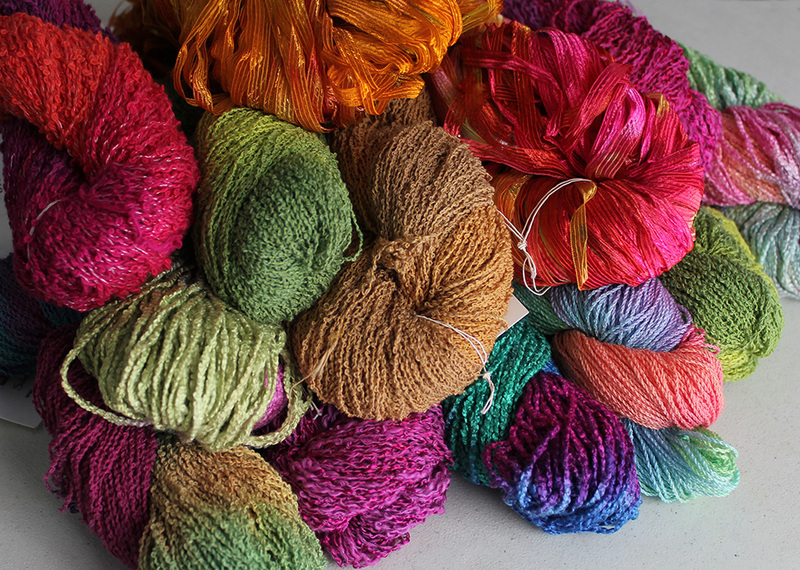 The backgrounds of the bowties are various muslins and beiges from my stash. As always, I didn't worry about straight lines, perfect corners or matching things perfectly. At the last minute I decided to add the yellow border and I'm glad I did. The backing is unbleached muslin. Light cotton batt. I quilted with heavy yellow thread. Final size is about 80 x 55. This one is a family favorite already and I've had a request to make one with cherry motifs next year. [I've already got a stack of fabric waiting]. 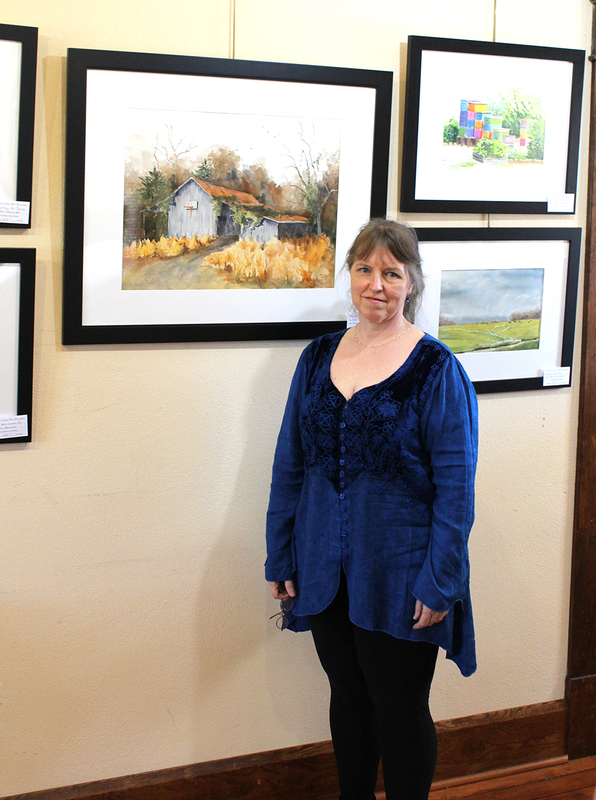 Thanks to everyone who came to the opening reception for my art exhibit at the Lawrence County Art Association gallery in Bedford, Indiana. We had a great time! There was a steady flow of people visiting and chatting. I got to know some wonderful new art lovers. I am pleased that two of my pieces sold that night. The gallery is at 1402 J. St. Bedford, Indiana. 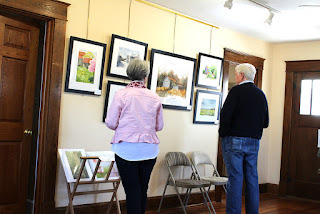 If you're able to stop in to see the show, I'd love to hear your comments. Please fill out one of the cards on the table at the exhibit.